It is very difficult for some people to admit that they’re wrong. It makes them doubt their self-worth, and no one likes to be portrayed as a failure. However, as adults, we must all admit that we are sinners and that we will make mistakes. We are going to make poor decisions that hurt our mates, and we are going to have to admit that we were wrong. We have to accept responsibility for our own failures. For many individuals, all they want is to hear the words, “I am wrong.” If the apology neglects accepting responsibility for their actions, many partners will not feel as though the apology was meaningful and sincere. Many partners need to learn how to overcome their ego, the desire to not be viewed as a failure, and simply admit that their actions were wrong. For a mate who speaks this apology language, if an apology does not admit fault, it is not worth hearing. Being sincere in your apology means allowing yourself to be weak, and admitting that you make mistakes. Though this may be hard to do for some people, it makes a world of a difference to your partner who speaks this language. For yourself or your child? Are you in a relationship or single? So many parents wonder about their child's love language, and admittedly, determining the love language of a young child requires some educated guesswork. Why? Because young children can't yet verbalize their love language. Therefore, the online assessment might not reflect an accurate reading of their primary love language. In light of this, for children ages 5 to 8 years old, you might try the following exercise instead. Ask him or her to draw or call out some ways parents love their children. You should try not to guide their drawings or answers, limit their responses, or require more responses than what he or she is prepared to give at the time you ask. Depending on the child's attention span and the time of day, you may get many answers, or you may get very few. If it seems like slow going, then you may want to secretly explore the subject of love with your child for a week or so until you can deduce what he or she perceives as love. You may find yourself reading books or watching programs with your child and asking the question, "How do you know that mommy or daddy loves that little boy or little girl?" Or you may intentionally experiment by expressing love in each of the 5 ways over a week's period of time. This will be a subjective measure, but the combination of all these suggestions—studying your child's answers or drawings, listening to their answers about other parents and children, and "measuring" their response to your expression of each of the five love languages—should be enough to help you accurately assess your child's primary love language. If you are lucky enough to catch your child in a talkative or expressive mood, you may be able to get him or her to identify several ways parents show love. You'll be looking for a theme or a repetition in their answers, and from this, you can accurately determine your child's love language. More than 1 MILLION sold! You know you love your child. But how can you make sure your child knows it? 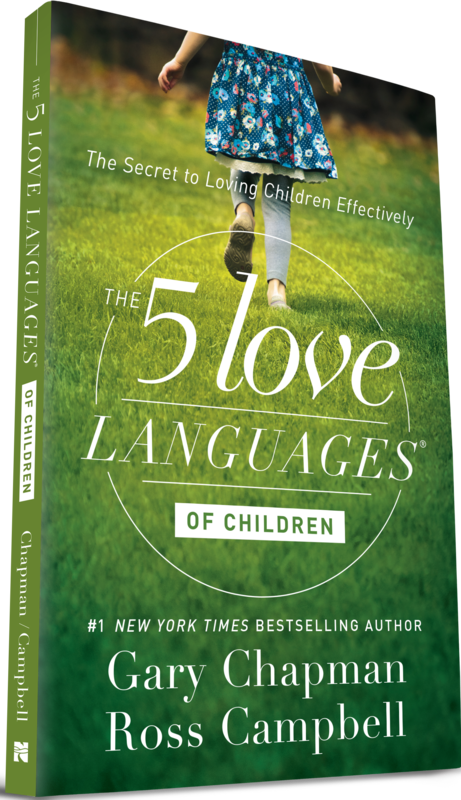 Plus: Find dozens of tips for practical ways to speak your child’s love language. Discover your child’s primary language—then speak it—and you will be well on your way to a stronger relationship with your flourishing child. This wonderfully imaginative children’s hardcover book by bestselling authors Gary Chapman and Rick Osborne, featuring four-color illustrations (with hidden details!) by Wilson Williams, Jr., will help children learn the importance of love. 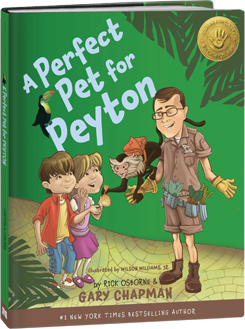 Based on Gary’s highly successful The 5 Love Languages®, A Perfect Pet for Peyton tells an entertaining and playful story of five children who each, with the help of Mr. Chapman and the unique pets at his special emporium, discover their own personal love language. Children and parents alike will experience firsthand the power of the love languages as they cuddle up and spend precious time together reading this book over and over again. By the time a child is 9 years old, he or she is better able to identify and express his or her feelings about love than when he or she was younger. Parents still have to keep in mind that children this age have a limited attention for and limited interest in such things as helping you determine their love language. The following online "game" should help you in your research. Tell your child you would like help solving "The Love Language Mystery Game." Explain that you need him or her to look at a list of "clues" and that these clues are comments that parents sometimes make to their children. Your child will see a set of 20 clue boxes, each with two comments. He or she must pick one of the two comments in each clue box based on which comment they like better. Explain that at the end of all the clues, you and your child will see their results and solve the mystery. If your child asks what the "mystery" is or what it is about, you can simply explain that it's a game in which parents are trying to learn what makes kids happy or what they like to hear their parents say. To give this a game-like effect, you should secretly write on a piece of paper what you think your child's love language is (words, touch, time, service, gifts). Do not let your child see your guess but tell him or her that you have written down your guess and will find out at the end of the game if you guessed right. After your child has received their results at the end of the "game," reveal your guess and tell your child if you guessed correctly. This activity will have been little more than a game to your child to see if he or she got the same answer to the "mystery" that you got. He or she will have little clue that you're using this information to further confirm or clarify your guess about his or her love language. Because children expect games to end in a "reward," tell your child at the end of the "mystery solving" that, whether or not you guys ended up with the same answer, you'll celebrate by doing something fun together (i.e., eating a favorite snack, watching a movie, playing a game of your child's choosing, etc.). Some children will help "solve the mystery" and be satisfied not asking any questions. If your child happens to inquire about this so-called mystery you wanted help with, give a brief explanation of the love languages and tell your child that you just want to make sure he or she recognizes and receives your love. Depending on your child's maturity level, he or she may be able to share his or her thoughts on the matter and further clarify his or her love language. You are now ready to introduce your child to "The Love Language Mystery Game." After you click the button below, you'll see a brief set of instructions that explain to your child how to take and score the profile. Because of your child's age and potential questions he or she may have, be prepared to read the instructions to him or her and answer any questions he or she may have. Have fun, and enjoy unlocking the mystery of your child's love language! The Love Language Profile for Teenagers is designed to give you a thorough analysis of your teenager’s emotional communication preference. It will single out their primary love language, what it means, and how you can use it to better understand them during this stage of their life. Invite them to take the assessment and share their results with you. Not only will you show them that you care, but that you are also striving to be a better parent. You may want to first take the profile yourself, selecting the statements you believe most accurately describe your teen. Then once they have also taken the assessment, compare your results with theirs. This can make for a lively and constructive conversation. Socially, mentally, and spiritually, teenagers face a variety of pressures and stresses each day. 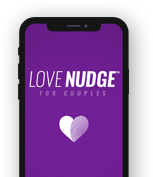 Despite these pressures, it is still parents who can influence teens the most, and The 5 Love Languages of Teenagers equips parents to make the most of that opportunity. In this adaptation of the #1 New York Times bestseller The 5 Love Languages (more than 10 million copies sold), Dr. Gary Chapman explores the world in which teenagers live, explains their developmental changes, and gives tools to help you identify and appropriately communicate in your teen’s love language. 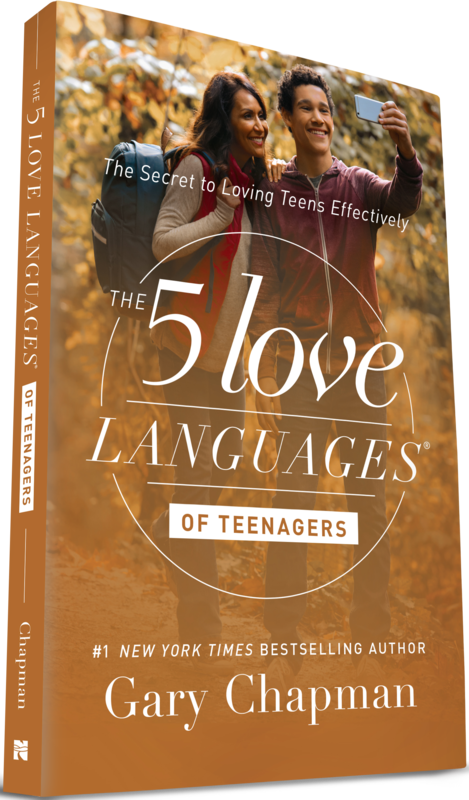 Get ready to discover how the principles of the five love languages can really work in the life of your teenage and family.